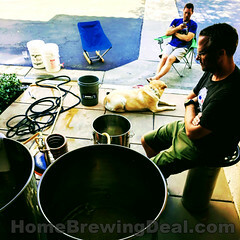 MoreBeer.com Coupon Code Description: Currently at More Beer, you can save $200 On A Stainless Steel Home Beer Brewing System while supplies last. If you are looking to buy an affordable, stainless steel, all grain system to make great beer, this is the home brewing deal for you! This complete all grain brewing system is built by Brew Built and gives you everything you need to start doing all grain home brewing. 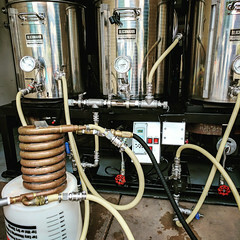 With this Brew Built all grain home brewing system you get 3 Brew Built home brewing burners, along with all of the other homebrewing connecting hardware you need, and 3 BrewBuilt stainless kettles including the Mash Tun, Boil Kettle, and Hot Liquor Tank! The Brew Built Home Brewing System is made in the USA from high quality, food grade 304 stainless steel. The Brew Built After Burner home brewing burners are sturdy burners that will boil beer quickly and support the largest kettles with ease. The BrewBuilt Burner is designed to bolt together, via the included connecting package, to create your own all-stainless dream stand. Also included, handle and casters which allow the connected brew stand, to be moved without straining your back. Brew Built home brewing brew kettles are built from 304 stainless steel and offer an unparalleled mix of features for the price. At the very top of the list are two welded-in place couplers that offer a lifetime of leak free use. Welded fittings offer a permanent connection that to us is worth every penny. The second unique feature that we absolutely love about these brew kettles is the notched lid with silicone plug. Some photos from today’s homebrew session. Here are some photos from my most recent home beer brewing session. I am working on a new homebrew recipe, a Irish Cream Imperial Stout. I have no idea how it will turn out, but if it is better than average I will be sure to post the recipe in case anyone is interested in brewing it! I hooked up my More Beer Ultimate Sparge Arm and am recirculating the mash through my RIMS temperature control unit. Post boil, I am whirlpooling my wort to collect all of the trub in my trub trapper while also chilling the wort down to 65 degrees in preparation of fermentation. All done with the brew session and now I am cleaning the brew rig with the PBW and hot water. I toss the wort chiller right in and recirculate the PBW and Water through that, my sparge arm and my hoses that come in contact with the wort. I let it sit over night and then scrub and rise everything with clean water. Making a few tweaks to the brewery today. Placed a notch in the lid of the mash tun. Also working on a new Irish Cream stout recipe. 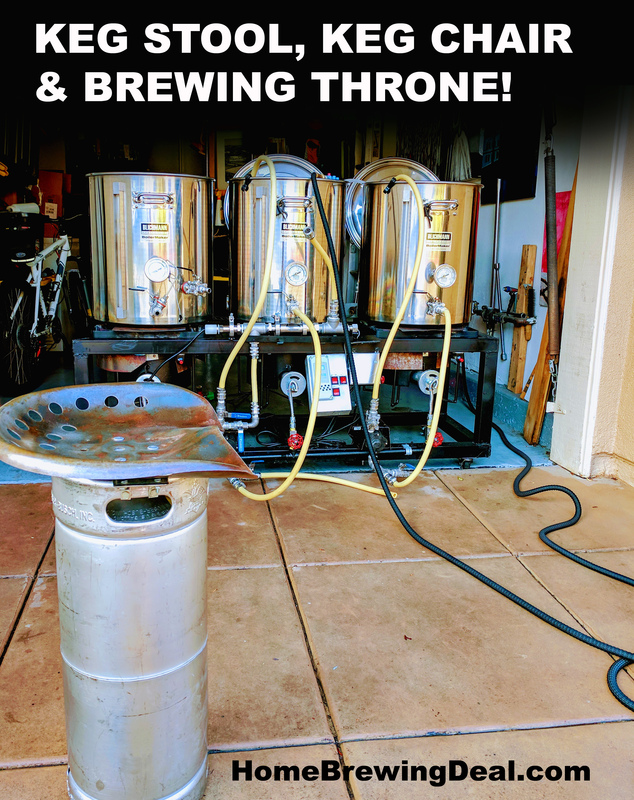 Home Brewing Keg Stool, Keg Chair or Beer Brewing Throne! It was just about brew time and one of my buddies showed up with a wonderful gift for me! He crafted me a keg stool, keg seat or keg throne; however you want to label it! To me it is an awesome addition to my home brewery and I am very grateful for him having made it for me! He used a 5 gallon beer keg and an old tractor seat to make this one and says he may also be making a different version of his keg chair! If he does I will be sure to post some photos of that as well. There is a NEW Homebrewing System in town! Introducing the Keg King RoboBrew! 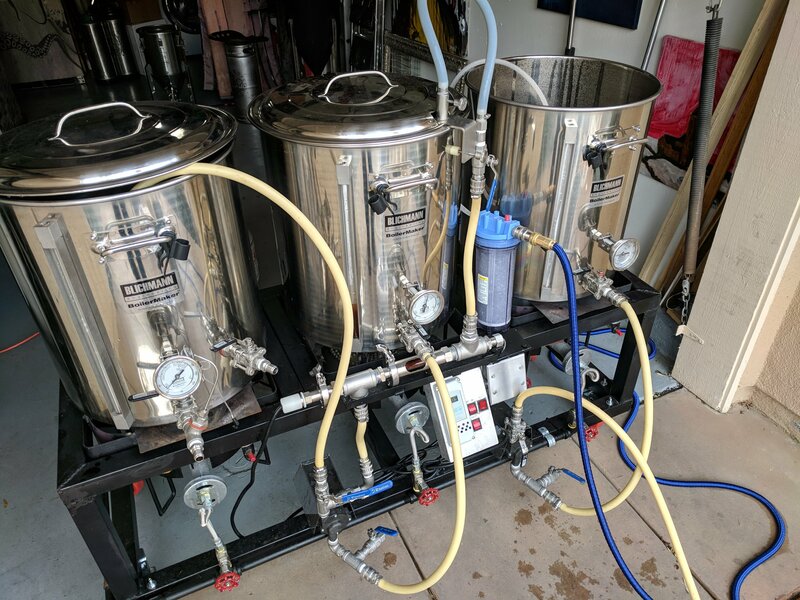 Coupon Description: Compact home beer brewing systems have been all of the rage over the last couple years as manufactures have been coming up with clever ways of simplifying all grain home brewing and shrinking the footprint of home breweries. Keg King has now entered the market place with their ROBOBREW digital home brewing system. While the name may be less than desirable, they certainly got the functionality right for their home beer brewing system. For the price, it is difficult to find a better home brewing setup. 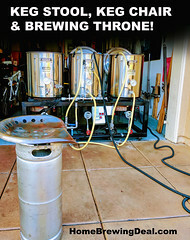 The Keg King Robobrew home brewing setup includes a pump for recirculation with an on off switch, as well as a false bottom and grain pipe to both protect the pump from clogging, and hold the crushed grain above the bottom for good wort circulation. That is a big feature upgrade when compared to lower cost homebrewing systems. The Robobrew holds 9 gallons which makes it the perfect size for 5 gallon batches of your favorite home brewed beer. The grain basket even holds up to 18 pounds of crushed malt and grains! I real plus is the Robobrew runs on a 110 volt plug, so you do not need a 220 v to power it unlike some electric home brewing systems; you also do not need to worry about running out of propane during your brew day since it is a fully electric home brewing system. The Keg King ROBOBREW is like a simplified Grain Father home brewing setup. The Robobrew has a basic electronic thermostat that lets you set temperature and relax while the Robobrew electric home brewing system handles your mash conversion for you. Heck, you can even program the Robobrew home brewing in advance! The Robo Brew includes just about everything that you need to start brewing right out the box and it is built from almost entirely stainless steel! In fact the Robobrew even includes a stainless steel immersion wort chiller with standard 1/2″ hose barb outlets! The Robo Brew home brewing system also includes a Digital Backlit Temperature Control, Malt Pipe, Dual Element Heating, a stainless steel 1/2″ ball valve and Magnetic Pump! With all of this, the ROBO BREW is one of the best home brewing deals out there for just $499. For more details on the Robobrew or to purchase one, please click the link. MoreBeer recently released the latest version of their Digital Home Brewing Brew Sculptures and if you have not seen them, you should check them out. What I like most about More Beer’s home brewing rigs is simply reliability. There are a lot of advanced home brewing systems out there, but the More Beer digital home brewing system is about as top of the line as they come. When you are dealing with digital controls, temperature regulation and flow control if your system is not reliable it become very easy to destroy a batch of beer. More Beer has been building and innovating home breweries for as long as I can remember and their home brewing setups are used by some of the highest regarded breweries in the world for creating test batches. A few breweries that use them are Russian River, Sierra Nevada and Stone; and that is just a few of them. What More Beer has built with their latest version Brew Sculpture is basically a miniature professional brewery for your garage. Made from 304 stainless steel making for the ultimate home brewery that will outlast you. No paint or powder coating, just like a professional brewery. Every Homebrew Sculpture includes folding handles and built in rear casters that allow you to move your Brew Sculpture with ease. Oversized 304 stainless steel home brewing Kettles with welded fittings, notched lids, internally etched volume markers, aluminum clad bottoms, and silicone handles. Built to last. The More Beer Large option comes with 22 gallon kettles, while the extra large model it comes with 30 gallon kettles. The fluid path is easy to use and clean. We’ve included the time tested, top of the line March pumps along with heat resistant food-grade silicone tubing and our own specially designed stainless quick disconnects. Burners are fast, efficient, quiet and have great flame control. Mashtun includes the More Beer home brewing Ultimate Sparge Arm with innovative design to eliminate hot-side aeration. This is the same sparge arm that I use for my home brewing system and it is fantastic! The center draw outlet with quick disconnect is locked in during mashing but easily disconnects for cleaning. The mash screen has a very low volume of base water under the screen to aid with efficiency and mash consistency. The perforated stainless mash screen is reinforced for use with pump recirculation and includes a silicone gasket to make a perfect seal with the kettle wall. Internally etched volume markers make mash water additions super easy. 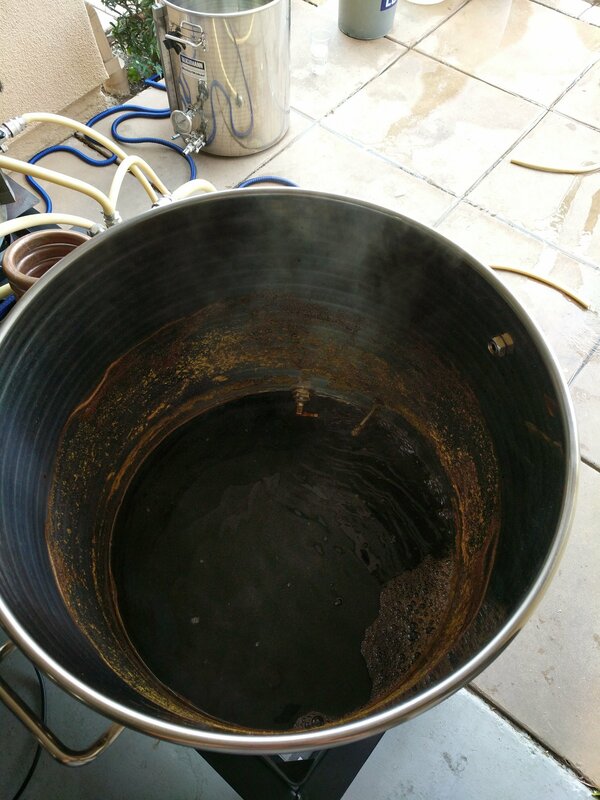 Boil Kettle includes innovative Whirlpool maker for leaving hops and trub behind. Volume markers are etched on the inside so you know exactly how much wort you have at all times. The lid notch is super handy for hanging hop bags, using an immersion chiller, etc., but when not is use an included silicone plug seals the notch. The bottom of the boil kettle is tri-clad with a 4 mm aluminum core sandwiched between two layers of 304 stainless. The aluminum core eliminates scorching and the cleaning that comes with a scorched kettle. Easy Mashing – Choose from 3 preset mash schedules or Custom design your own with up to 5 steps. From there the control panel guides your mash through the temperature raises and time rests automatically. Always Hot – Controller maintains the Hot-Liquor tank temperature you choose by turning the burner off and on automatically. Manual Mode – allows you to control pumps manually for anything you want such as cleaning. Ohhh and did I mention that these digital home brewing systems ship free! Cleaning home brewing equipment is now my favorite aspect of home brewing, but I know that it is a critical part of creating good beer and keeping my home brewing rig functioning properly. My home brewery has grown to the point where it has gotten complicated to clean. Home brewing equipment such as ball locks, hoses and pumps create pockets of space where bacteria can thrive. After a home brewing session, you have basically created the ideal environment for a bacterial incubator to form. 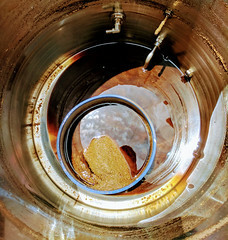 It is a damp, dark environment that has a thin sugary syrup coating everything from the wort passing over it. If you do not clean properly, you are setting yourself up for possible beer contamination and off flavors. I do not worry about my Hot Liquor Tank and the pump that drives it since it is only passing hot or cold water. I just make sure that the pump, valves and hoses are kept free from moisture. As far as my RIMS, Mash Tun, Boil Kettle, Valves, Hoses and Pump that feeds those system goes, I have a different process. The primary aspect of that process is recirculating a warm / hot (120 F) bath of PBW over everything for 15 minutes. You can actually see the water change in color after it has recirculated for a few minutes. I then allow the equipment to soak over night, then heat the solution again and flush it with clean water. I then break down my RIMS system and scrub out any lose debris, scrub my valves and reassemble. Like I said, it is not fun, but cleaning is an important part of brewing. Doing the final cleaning of the home brewing system. After cleaning out all of the kettles and the chiller, I fill a bucket and throw in a scoop of PBW. I enable the RIMS system and have it circulate the water and PBW in the bucket. I bring the water temp up to about 1ooF happens pretty quickly since it is only about 3 gallons of water. I let it circulate for about 5 minutes once I have hit my desired temperature and let the PBW do its magic. After that I break down the homebrewing RIMS system scrub everything, reassemble and flush with clean water.